This photo was a joint effort by Jenna and me using her photos and fonts and my Photoshop skills for inclusion in their Year Book! This memory was posted in Wordless Wednesday and tagged Besties, Wordless Wednesday on June 19, 2013 by Grandma Kc. Cute, cute, cute x 3! Oh never mind, that would make it 9! Let me start all over again! 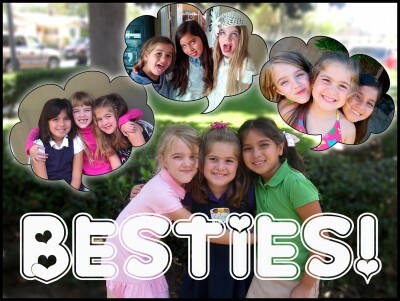 Those are 3 adorable FOURTH GRADE besties! I’m impressed! I’m hopeless in Photoshop. You have some mad skills! Awww! That is so cool. I’m sure she LOVES it! Sweet stuff. Such sweet faces!! That is a precious picture! I think you have proven your 3rd grade teacher wrong!! Keep up the good work, big sister!